The First Hall of the Civil Courts in its judgement explained that the difference between the 10 year and 30-year acquisitive prescription is not only the lapse of time. This was explained in a judgement delivered on 18 March 2018 in Rita Borg Weaver v John Pace Antji Calov presided by Mr Justice Toni Abela. The plaintiff explained in her application that she is the owner of a property 354, Triq D’Argens, Gzira, which was purchased in June 2015 from Christopher and Alexandra Vassallo. The property includes the airspace. However, the defendants, their next door neighbours, are not allowing them to use part of their roof since there is a wall. The defendants own 356, Triq D’Argens, Gzira and also own their roof on their property but the purchase contract does not mention that they have a right on property numbered 354. The plaintiff asked the Court to declare that that part of the roof occupied by defendants be declared as being held without any legal right and order them not to desist the plaintiff from taking it over. The defendants filed a number of pleas, the first of which is that the action is time barred in terms of Articles 2140 and 2143 of the Civil Code. The judgement delivered was limited to this plea. The Court held that this is an action which is intended to establish a right that part of the roof belongs to the plaintiff. 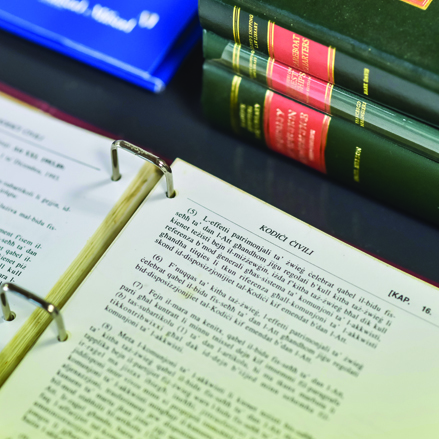 The Court held that according to case-law (Anthony Mizzi et v Alfred Cachia noe decided on 15 March 2011), the action of original title put a strong onus of proof on who is claiming the right. It is not sufficient that the plaintiff shows that the property does not belong to the defendant. The defendant is not required to prove anything, as long as he does not claim that he himself has a title over the property. The only defences against an action claiming original title, may only be made, if there is a claim that he has a title over the property and not merely possession. The plaintiff on his part must prove that the title was not passed on from someone else. Another type of evidence is derivative in that the property was passed on to him. If the plaintiff is unable to prove that he has the original title he is allowed to prove that he has a better title than that of the defendant. The comparison of legal titles is carried out by the Court if the defendant claims that he has a better title than the plaintiff. In this case the defendants are claiming that the action is time barred. The defendants based their plea on Article 2140 ad 2143 of the Civil Code, which in turn referred to Article 530(2) of the Civil Code, since the possession of this part of the roof was held by the previous owners who inherited the property of the defendants in 1945. The property was rented to third parties and therefore the owner, Ms Moore, rarely visited the property. Article 2140 of the Civil Code deals with acquisitive prescription following a 10 year period. According to Ray Camilleri -v- Aldo Farrugia et a judgement delivered on 27 January 2011, the elements of this prescriptive period are that the title must be satisfactory to be able to transfer the property, possession, possession in good faith, possession for 10 years, possession must be continuous, uninterrupted, peaceful and public and not subject to any legal stipulation. Anyone claiming this would have to prove these elements and these must exist together. If anyone of these elements do not exist, then the plea of prescription would not be successful. Mr Justice Abela looked at the will of the vendors’ father of door number 356, which did not mention that the property had a right over the roof of number 354. Other witnesses testified that they remember the dividing wall in the 1950s, therefore, the wall was not constructed before the death of the previous owner’s father of property 356. This right on the property of number 354 was not mentioned in the 2007 contract when the defendants purchased the property. The Court pointed out that a contract does not need to mention a description of the overlying and underlying rights of the property, however, it does require a description if there is a right overlying another person’s property. The contract mentioned that the 356 property included a roof and this is understood to be the roof over the property and not including part of next door’s roof. Therefore, the first element of the 10 year acquisitive prescription failed, since the possession was not in good faith. Furthermore, the property was purchased in June 2007, while the action was filed in May 2017, within the 10 year period and therefore, the possession was interrupted with the court action. The Court in its judgment then moved on to analyse whether there existed a 30 year acquisitive prescription. The judgement quoted a previous judgement Emmanuele Inquanez -v- Carmen Bonnici decided on 26 May 2006, The Court, then held that this required that there be legitimate possession of the property for 30 years. The Court further held that how the plea of Article 2143 of the Civil Code was raised was more of the extinctive prescription, than an acquisitive prescription. The non-use of the property does not extinguish one’s right over the same property. For the 30 years prescriptive period to be successful there is need of possession for 30 years and the possession must be as the owner. Here also the possession must be continuous, uninterrupted and peaceful and exclusive. The possession can be held by the previous owners of the property. The evidence produced concentrated on the existence of the wall on the roof, where they claimed that the plaintiff and previous owners lost the right of that part of the roof. However, this is not sufficient since the defendants had to show the court that the previous owners had exercised the right n terms of Article 2143 of the Civil Code. Although good faith is not a requisite, just the same the possession must be proved in terms of Article 524(1) of the Civil Code. It is not sufficient that people remember that the wall existed or held on behalf of the owners, but also if the owners did not know of this wall. There is the need to prove that the owners were aware of this possession since Ms Moore testified that although she was an owner, she never visited the property, since it was rented and therefore, the prescription period could not commence. Therefore, the Court turned down the prescription plea and ordered that the case continues.